Recently I started crocheting again. Not the best thing for my hands but I do enjoy crocheting very much. The last county fair I entered a square pineapple doily and it won a first place! The only reason I won first was because I used size 30 thread and the second place winner used 10. Because the second place piece was a truly beautiful Filet of Mary. It was nice to have a real competition. 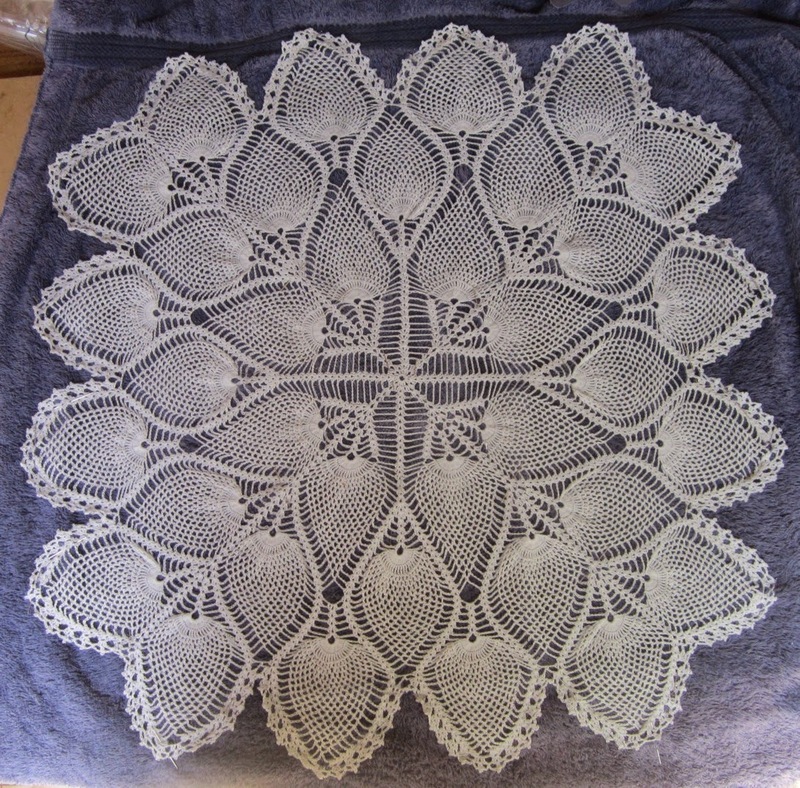 Square doily during starching process. Our local judges won't even consider a piece unless it is well blocked and startched. First I washed it and soaked the doily in a cornstarch mixture. However when I laid the doily out to dry it became apparent that the starch mixture was too weak. 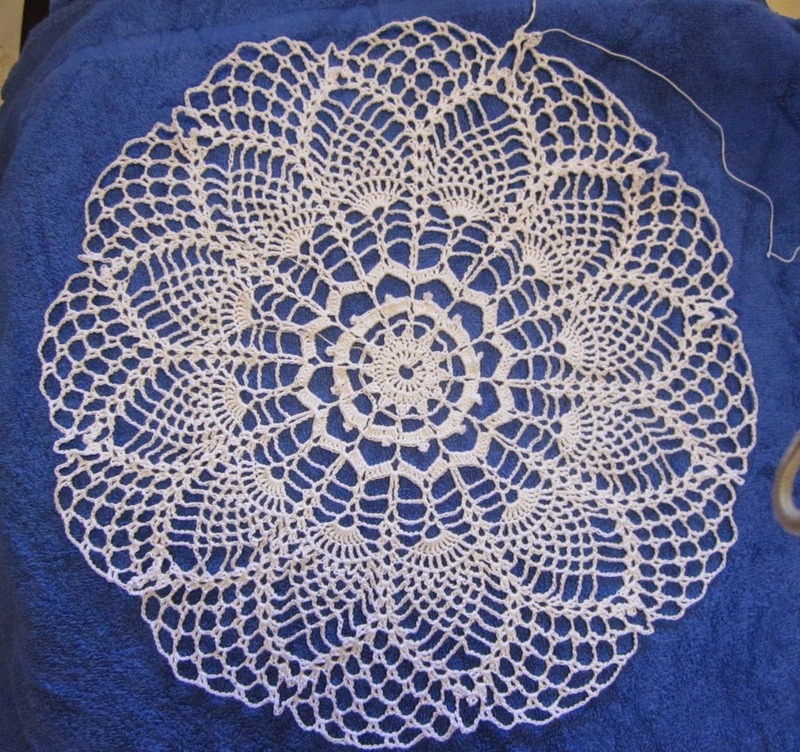 So once I had the doily blocked I used canned spray starch to finish stiffening the project. Personally I like my doilies lightly starched so they are softer to the touch. One project this year has been to try and get my craft area in order and move my projects out of the bedroom. I keep all my projects in bags to protect them but it is always the open bag that gets a drink knocked into it! So organizing has taken some time. However I have found some things I had put away in the wrong spots which is nice. One find was the above doily sister. I have made this doily 4 times now. 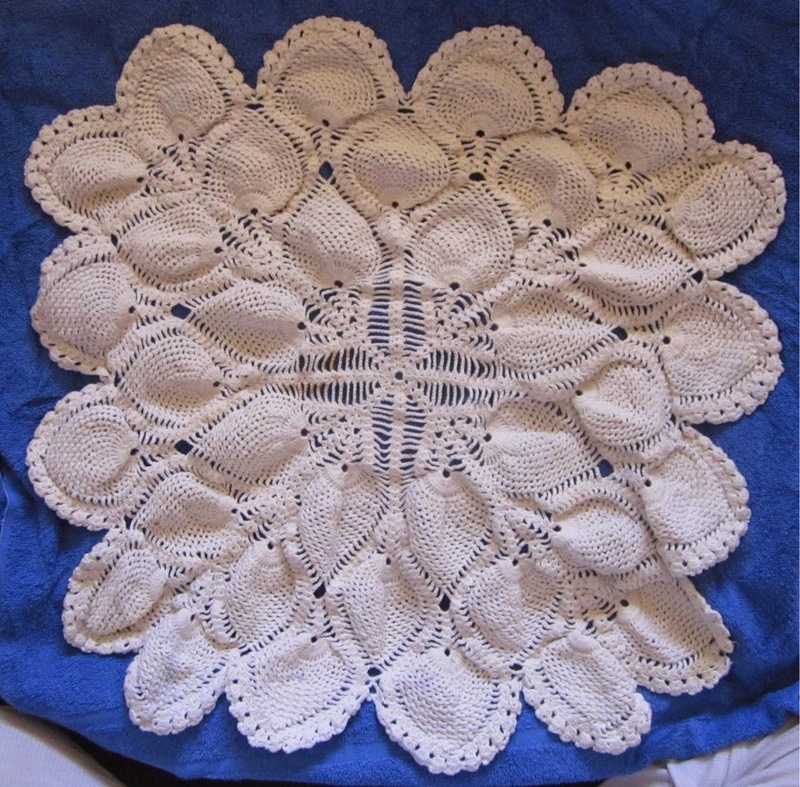 Here is a picture of the doily I made for my mom. Same pineapple doily made 25 years ago. Even without starching the doily you can still see how much my crocheting has loosened up over the years. The doily was damaged when my mom set it on fire with her cigaret and then my nieces colored it with magic markers. So I tried for a long time to get the stains out and then just put it away. Now that I have found it again I want to make it into something. What the doily will end up is anyones guess! Currently I started a new doily, I'm making it as a gift. The design is very open compared to the denser designs I usually choose. It has worked up in 5 days instead of 3 months which is nice. I'm on the last two rows. Unfortunately the cat decided to help and now I can't find the hook! Well there are still a few days to finish it and I'm sure it will turn up. One thing I have learned about crocheting, try not to use another hook even the same size and company because they are all a little different! Latest doily is a gift. Nothing really of interest to say about myself. 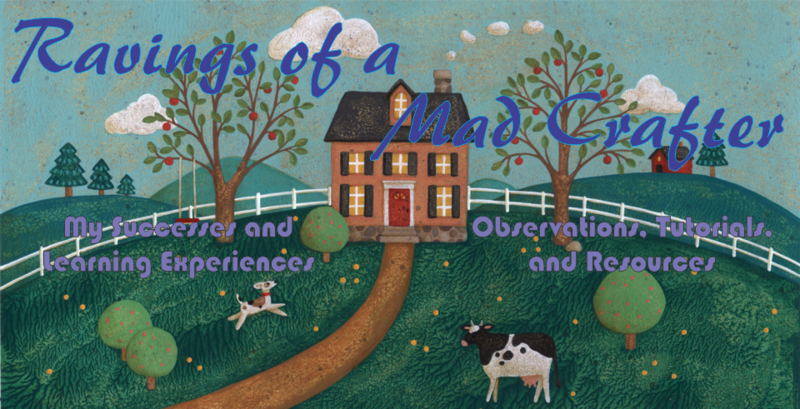 I started the blog as a way of sharing hobbies and projects. Hopefully someone will find these entries interesting and maybe even learn something.